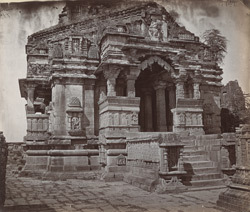 This photograph was taken in 1882 for the Archaeological Survey of India. It shows the entrance to Kumbha Shyama Temple in Chitorgarh, originally constructed in the eighth century, and later enlarged in the fifteenth century. The high basement, the wall niches, the columns and the ceiling panels are part of the original features while the mandapa with the pyramidal roof and the clustered tower are later additions. South of the temple, and part of the same precinct, is another temple dedicated to the fifteenth-century saint poet princess of Jodhpur Mira Bhai. The sanctuary of this memorial monument is covered by a curvilinear tower. Chitorgarh in the modern-day state of Rajasthan was an important Rajput fortress throughout the medieval period. It served as a political capital, despite being sacked by both Ala-u'd-din Khalji in 1303 and Bahadur Shah of Gujarat in 1535, until it was finally taken by the Mughal emperor Akbar in 1567. It was later returned to Rajput control but never regained such prominence again.